Computer Science Education Week (CSEdWeek) is an annual program dedicated to showing K-12 students the importance of computer science education. Right now around the world most students don’t get exposure to computer science in middle or high school. "Hour of Code” is an introduction to computer science designed to demystify code and show that anyone can learn the basics. It’s a movement to recruit 10 million students of all ages to try computer science for one hour. TouchDevelop is developed by the Research in Software Engineering group (RiSE) at Microsoft Research. We want to explore how the future of software development might look like when the most commonly accessible computing devices are mobile devices. We have found that TouchDevelop is a great way to learn or teach programming. The TouchDevelop Web App runs on virtually all recent platforms, including iPad, iPhone, Android (phones and tablets), Macs, PC. For the Windows Phone, you can download the TouchDevelop app from the Windows Phone Store. The TouchDevelop Web App is written in Type Script. Watch this video from the //build/ conference to learn more. 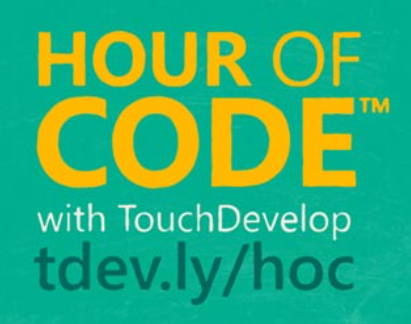 Our TouchDevelop Hour of Code website is: https://www.touchdevelop.com/hourofcode2. Another tool option for your one hour of code is to do visual programming with FUSE Lab Kodu. Kodu lets kids create games on the PC and XBox via a simple visual programming language. The Kodu team will have an hour of code tutorial and activity up the first week of December located here.